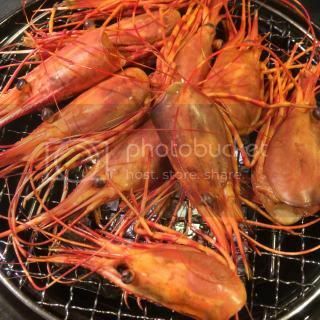 Ama-ebi (sweet shrimp) heads, smoked in donabe smoker, "Ibushi Gin"
One of the highlights of the photoshoot in LA was having Mori-san as a guest chef for our temaki (hand roll) sushi party! It took place on the final day of the 9-day shooting. So, it became our "wrap" party, too. 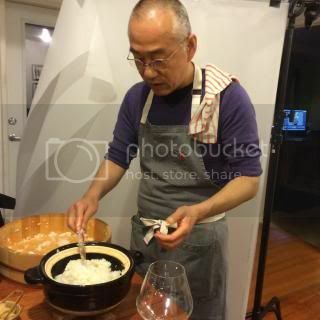 Chef Morihiro Onodera (a.k.a. 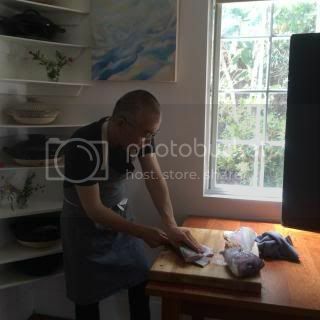 Mori-san) is one of the most highly respected sushi chefs in the US. 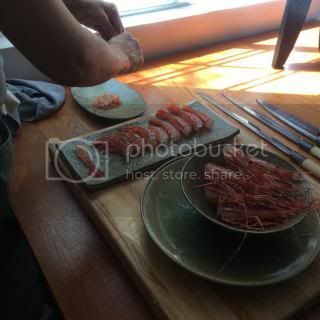 He came to support our DONABE Cookbook photoshoot! Now, his big project is growing premium Japanese variety short grain rice (Koshihikari) in Uruguay! So, it was a special collaboration of Mori-san's Uruguay rice x donabe x Mori-san's artistic technique. 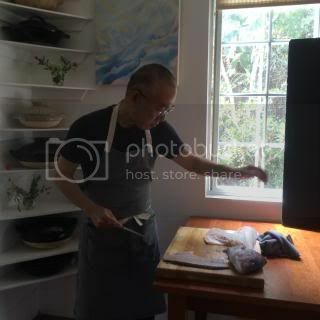 Our friend Peggye (Lee Fish) contributed beautiful fresh seafood including Madai snapper which came straight from New Zealand, and Mori San showed us his knife techniques with them. 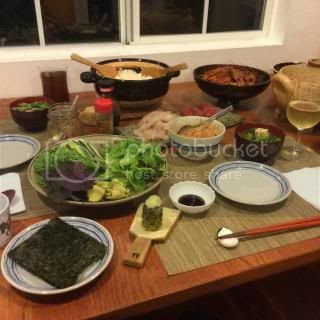 Once all the ingredients were ready, we set up a table for the temaki (hand roll) sushi dinner party. The donabe sushi rice was so special. I wish I had a photo of the dinner setting to show, but I got too excited to take any photos at the dinner table! But, of course, our photographer, Eric, took so many beautiful photos...you will see them once our DONABE Cookbook comes out. It was the most gorgeous temaki dinner I've experienced, and it was a perfect final evening of the long shooting days. Also, in this book project, all the short grain rice we used are Mori-san's Uruguay koshihikari rice ("Satsuki"). 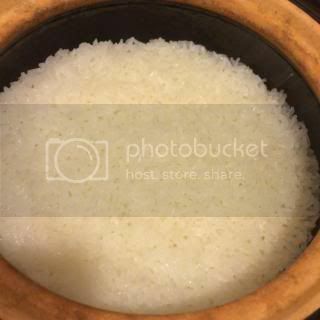 In the 9 days of shooting, we used up more than 35 pounds (15 kg) of his rice!! As Mori-san says, it's the "best rice outside of Japan"! The next day, we enjoyed the leftover ingredients to do another round of temaki dinner. 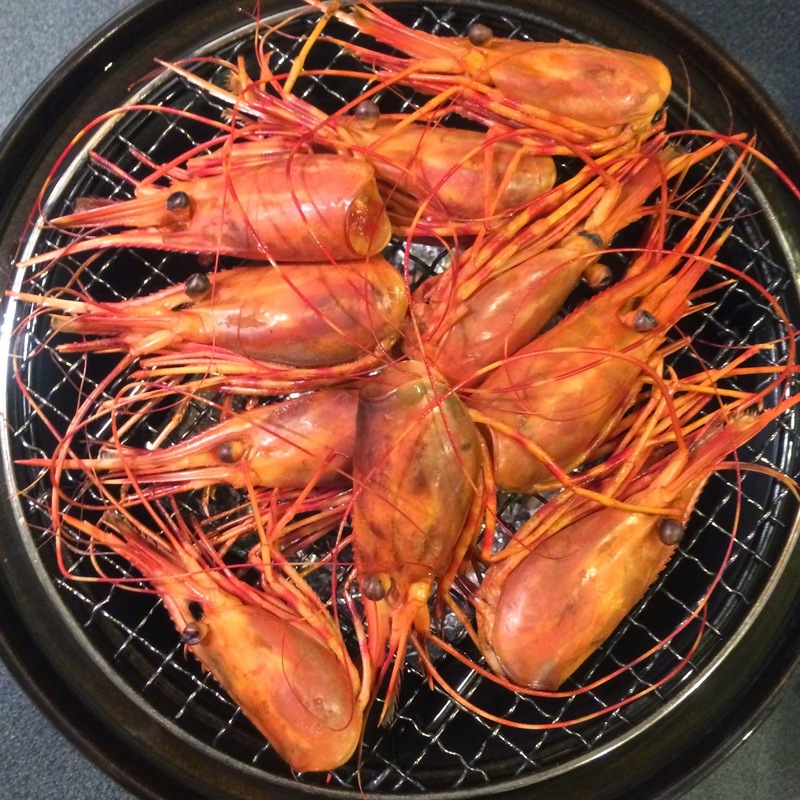 With the ama-ebi (sweet shrimp) heads, I made simple smoked crunchy appetizer with donabe smoker, "Ibushi Gin". They were so good. I also made fresh sushi rice and miso soup...all with donabe! Mori-san also gave me a sample of new crop Uruguay rice (just harvested), which just arrived in LA a few days ago and polished right before he gave it to me. So, the following night, I cooked it plain with my double-lid donabe rice cooker, "Kamado-san". It was AMAZING!!! Each grain was so shiny and had a perfect chewy texture. I thought, if I had blind tasted it, I would've thought it was one of the premium rice varieties from Japan. And, because it was the Kamado-san, it brought out all the best components from the rice. 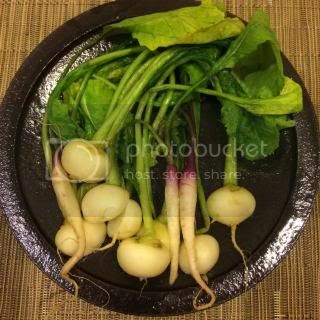 With such a high quality donabe rice, you don't really need anything else...so, I made quick pickles with baby radishes and turnips from the Chef's Garden as a condiment.